WE HAVE SHELTIE PUPPY AVAILABLE! Sheltie puppies 2 boys and 2 girls (sable &white) are available to loving pet homes only. KC registered, vaccinated, microchipped, comes with a full puppy pack and 4 month insurance. 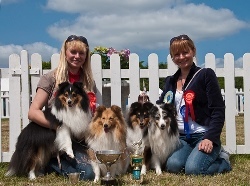 To date our Shelties have gained Five UK Champion titles, Five Junior Warrants, won Best In Show many times at breed Club Shows, 24 CCs as well as 2CC, 3RCCs & Best Puppy at legendary Crufts shows. I moved to the UK in 2004 and settled here in Cornwall, we registered with the Kennel Club in 2006 our affix "LAVIKA".